Was your New Year's resolution to pamper your pooch? If so, the Lapdogs have got you covered. Plus, they know how you can pamper your pooch without breaking the bank! Disclosure: Pooch Perks sent a January box to Lapdog Creations, free of charge, for review purposes. We only share information that we feel is relevant to our readers, and all opinions expressed are our own. If you click on our affiliate links and subscribe, we may receive a few pennies to help maintain this blog. A Pooch Perks Inc. subscription is sure to pamper and please even the fussiest pooches on the planet. The Lapdogs love their boxes so much, the don't even mind sharing. After all, there's always plenty of goodies stuffed into each monthly box to go around a multi-dog household. I love knowing that we'll always find top quality stuff inside our Pooch Perks boxes. All treats are made in the USA, and all toys are high quality. There's always a good mix of both -- but you can opt for a treats or toys only box if your pup would prefer! Plus, those monthly themes are always fun. January's New Year, New You box has all of the essentials covered - nutrition, grooming, and playtime! These all natural sweet potato treats are high in nutrients, low in calories and a perfect choice for sensitive stomachs. Not only is she cute, but she is stuffing-free and features an extreme squeak thanks to two Blaster squeakers. Her square shape makes the toy easy to carry, as Penny quickly found out. The Lapdogs love blueberries, and they love these new-to-us treats! These tasty little bites pack a big, beneficial punch. This lion doesn't roar, but the soft and cuddly plush toy sure does squeak. Featuring minimal stuffing and an extra layer of material to increase strength. The girls love him - Mama loves his funky colors. The Lapdogs have loved all of the previous flavors we've received in past boxes and Tropical Delight was no exception. Made with green bananas (which are really good for a dog's coat, digestion and muscle tissue) and coconut, these treats smell amazing. This fun-colored rubber ball is made of interwoven rubber tubes, creating angles which result in a crazy bounce and hours of playtime for you dog. This 100% natural, 90% certified organic shampoo is free of sulfates, preservatives, artificial colors, and artificial fragrances. The tear-free shampoo is also 100% biodegradable and 100% vegan. Pamper Your Pooch with A Monthly Surprise! 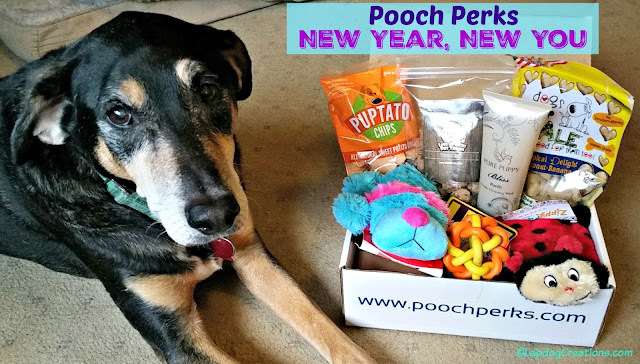 Click here to join at poochperks.com! 6 items, approx. retail value $60 - this box had 7 items! Stay tuned to hear more about February's Fifty Shades of Ruff! box. Hint: you won't want to miss it... start your subscription today! That is a very convenient way to spoil a pup and who does not enjoy that. 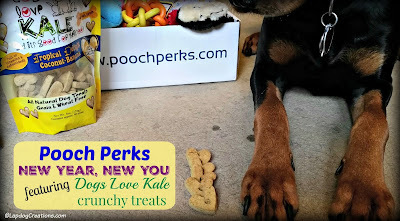 Kilo the Pug would love the sweet potato chips, the kale treats and the Lady Bug and Lion toys. I like the balance of toys, treats and 'useful stuff'. There is something for the pet owner and plenty for the pup too!! What a great box!!! Wowzers! Look at all those great goodies!!! Sounds like a full box of treats and toys that would make any dog happy! I love seeing all your doggie gift boxes. It looks like you have a good time with them. Lots of fun. I love subscription boxes. I keep thinking about getting one for my dogs, but they already have so much stuff! lol! Great balance of things - one of our favorite toys is the Zippy Paws Squeakie Pad Ladybug!! It's great and I can't recommend it enough! Love that they give you options for different size dogs! I think the lion toy would be Mr. N's favorite. It's his type of toy! I like the way they're structured with many options to customize your shipment. Will have to check them out! That ladybug toy is adorable! 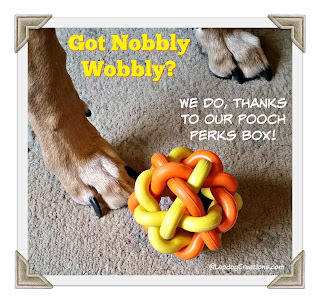 Reese would love that and Jack would have fun with the nobbly wobbly. When I get a little extra spending money, I want to get my dogs another subscription box. 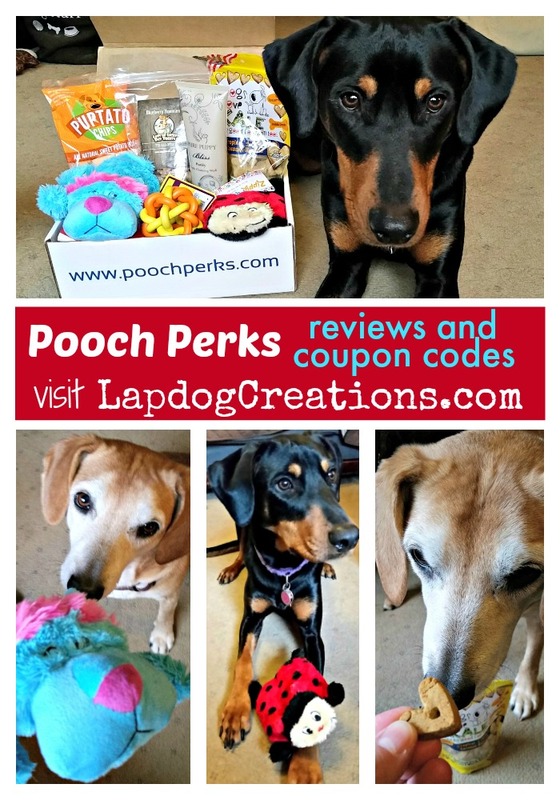 Pooch Perks seems like one of the best. I love these pet subscription boxes.